This week, I thought I'd take a look at a basic nine square reading. 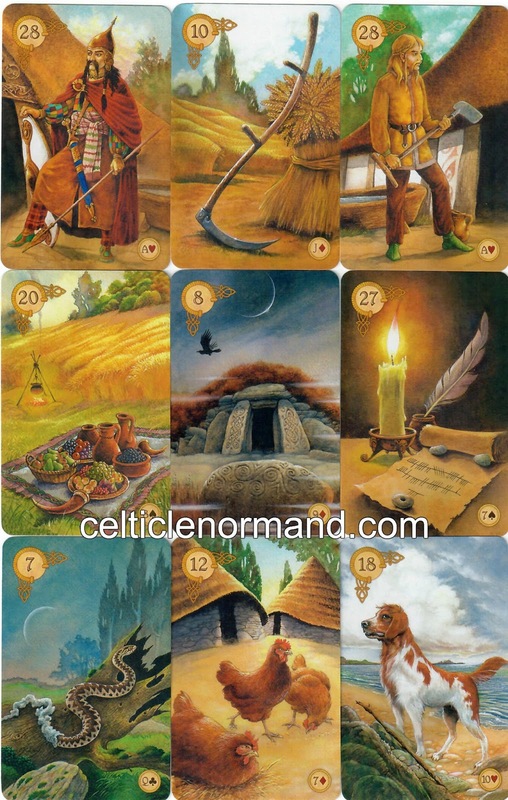 These cards were drawn for a young man who has recently left home, and who is looking for general advice from the cards. The move from the family home certainly seems to be on his mind, judging by the House, Sun, and Anchor combination at the top - home stability is at the forefront of his consciousness. As for what he has control over, the Bardess (Female Rider), Chickens (Birds), and Paths suggests that incoming information and social chatter have led to him having decisions to make, which he feels he can do. In fact, he says he is glad to have his own choices now, rather than having things being decided for him. The centre row suggests where he is right now: Owls, Letter, Mice. Written communication is causing a feeling of things having been spoilt. When I say this his face falls. He just received a letter that caused him a lot of distress, telling him that his student fees are being put up. Looking at the columns, House, Owls, Rider: information about his home situation being talked about. The client confirms that he had a discussion with his landlady the day before. The centre column is Sun, Letter, Chickens. Happy written social talk sounds like the texts his friends have been sending him as they try to bolster his morale. Finally, we have Anchor, Mice, Paths: stability being undermined by choices made. The client confirms that several recent choices have left him feeling rather uncertain about things. So much for the reading, and showing what is already known. This is something that many people complain about with Lenormand readings: they show what is, what the client knows. How about advice to draw from it? The top row (House, Sun, Anchor) suggests putting energy into his home in order to create a greater sense of stability. That could be in the form of feng shui, or simply by claiming the place he is now living more, through decorating it in some way. The client admits that he has done little or nothing to make his new flat feel homely, and thinks that getting a desk and chair to work at would be a good first step, as he currently just goes out to the library all the time. The bottom row (Rider, Chickens, Paths) as what he controls asks him to gather some more information around his choices, including asking people in his social group for their ideas. This makes him think about a friend whose parents have been complaining about all the junk in their "spare room". They might have some furniture they'd be happy for him to take off their hands. The centre row (Owls, Letter, Mice) suggests that talking about the letter he received will help reduce the impact of it - perhaps through useful suggestions friends might come up with, and the feeling of not being alone in decisions. He has been keeping these issues from his friends, feeling embarassed about his current situation. However, he recognises that if it were one of his friends, he'd be happy to help them out. Taking this on board, he considers who he might feel most comfortable discussing this with. As for the first column (House, Owls, Rider), once again talking about the information he has received from his landlady looks like it will help. Sun, Letter, and Chickens also suggests he get involved in the text/facebook conversations with his friends, as they are trying to be supportive. Finally, Anchor, Mice, and Paths asks if he could reduce his workload while he comes to terms with these decisions that have left him feeling uncertain. He acknowledges that he has been burying himself in work, and that this may not be the most productive way of dealing with the situation. 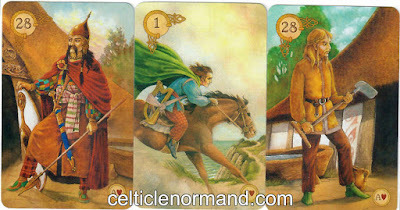 My thanks to Y for allowing me to use this reading on the blog. My first thought was 'working like a drudge'. I know that's not a traditional reading of the Woman card, but sometimes you have to trust your intuition. There's something about it being the Woman rather than the Lady, added to the positional meaning. Ha, yes, I have been writing a lot, and also worrying about how much I need to write. I have a business trip next week to prepare for, and which will take time away from my other pursuits. If I can find a sense of playfulness, that will combat the feeling of drudgery. I need to be open to the joy of these projects, rather than focusing on the time constraints. After all, worrying won't get them done any faster. How does this situation fit in my life (is it ecological)? I read this as having the required energy for this, I just need to tap into it by focusing on the fun side. Reading the line more traditionally gives me: written intuition (Woman, Letter - this blog) around a project involving study/ing materials (Letter, Book) allows me to open up the project (Book, Child) by bringing new energy to it (Child, Sun). This woman has energy (mirroring Woman, Sun), if she writes playfully (mirroring Letter, Child) to put into the projects at the heart of this reading (Book). This week, I decided to try something a little different. 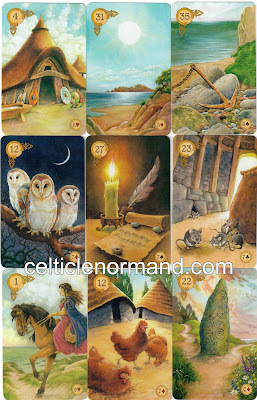 On Monday I posted a tarot reading using a Three Brain Spread based on ideas from neuroscience and life coaching, and I thought it would be interesting to do a version with the Celtic Lenormand. 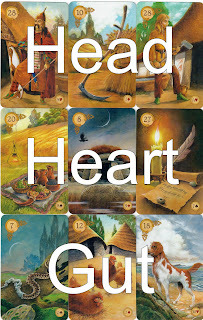 Drawing three cards, I interpret them as what our head, heart and gut are saying. Then, reading them all together is the overall message. Unsurprisingly, the Head card is all about rationality, logic and thinking you're in charge: the things our head-based ego normally talks to us about! The Heart tells us to listen to the messages around us, to be open to hearing what others have to say and what the Universe wants us to hear. The Man is more practical and down-to-earth than the Lord, more focused on how to get things done than on being in control. He is more about doing than thinking. This fits beautifully with an image I found, shown here courtesy of enneagram.co.uk, regarding the realm of each brain! 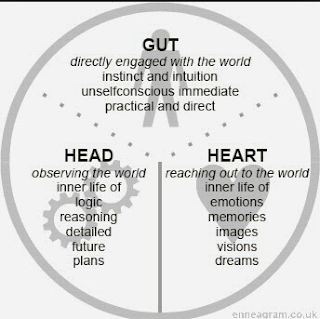 Moving forward rationally is aided by listening to the more practical messages of heart and gut. The cards absolutely agree - we mustn't think just with our head, but bring in our heart and gut, too, to have a well-balanced understanding of the world, ourselves and others. I like the imagery, as well. 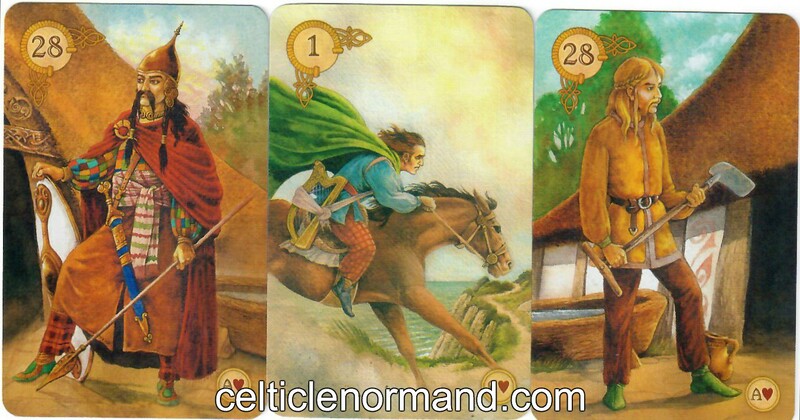 The head and gut cards look in different directions, it is only the Rider as messenger that links them together. And it's fascinating to have received both the "Male" cards - to emphasise both how this "thinking" by our gut and head is different and the same.